Is "Hair Food" As Good As it Sounds? Hair food sounds great…heck it sounds rather amazing! I mean, our hair needs nourishment and food is nourishment. Win-win, right? Well, if you have been scouring around looking for a new product that promotes itself as hair food then you are definitely at the right place! Finding information about this ultra-secretive, uber exciting, exclusive line is not an easy task so I shimmied my nosey self to my nearest Target to get the scoop. This new line by Clairol is divided into two collections: the Moisture Collection and Volume Collection. The Root Clarifying Shampoo stands alone. The packaging is earthy, the names sound inviting, and the infusions look amazing. The shampoos and conditioners have pumps (a serious plus) and I must say this line has me quite intrigued. The shampoo is silicone, parabens and mineral oil free and boasts of imparting moisture while you delight in the aroma of apricot. The paraben and mineral oil-free conditioner has water, fatty alcohols, conditioning agents, silicones, and fragrance as the first ingredients so not the best for the all-natural lovers but certainly not the worst, as it will provide the slip necessary for removing tangles and adding softness and shine. There is also a paraben and mineral oil free hair mask to round off this moisture collection. This collection is infused with kiwi fragrance, and just like the shampoos and conditioners in the moisture collection we see the shampoo is absent of silicones, parabens, and mineral oil. This collection is about giving your hair life full of volume and movement. No hair mask in this trio but rather a hair thickening treatment that is free of parabens, mineral oil, and preservatives. The thickening hair treatment captivated me with the instructions: “Use Daily. Apply to wet or dry hair. Spray 15 pumps at the roots to cover your scalp from the ear line up. Massage in with fingertips.” What can this magic product do? I am very interested to find out! There is only one product in this category: a clarifying shampoo that is pretty in pink, and an earthy pink at that. This clarifier is infused with strawberry ginger fragrance and is free of parabens, silicones, and mineral oil, and like all clarifying shampoos it promises to remove all buildup from your tresses. The prices seem reasonable with $9.99 for all the shampoos and conditioners which are in 10.1 oz. bottles and the thickening hair treatment is $12.99 for 6.3 oz. Right now they are buy one get one 50% off through the Oct. 11! This is the perfect time to check out one of the collections and if you have a red card from Target you will get that extra 5% off so honestly, what are you waiting for? 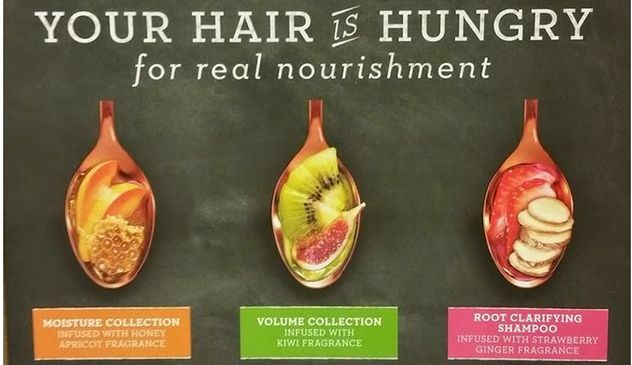 I am so interested in trying this new hair food, and if I had to choose I would try the moisture collection. Have you seen it or even tried it yet?